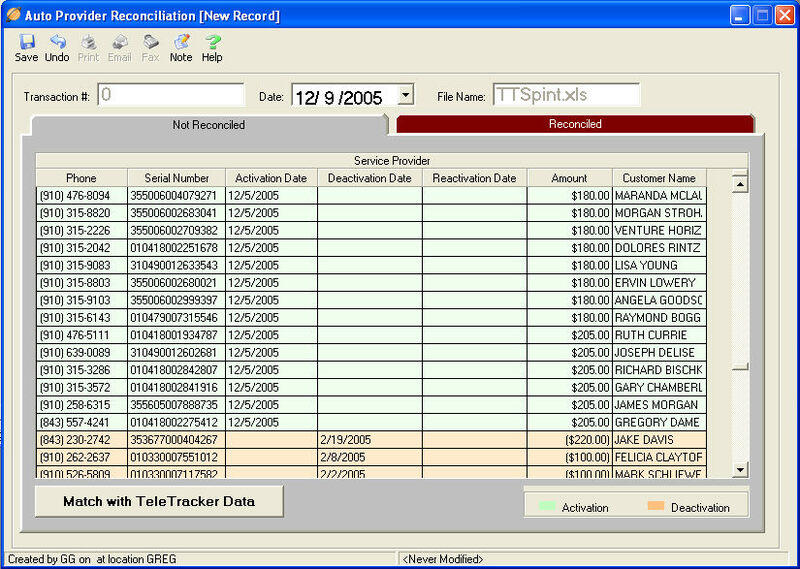 Not Reconciled : Because this is a new transaction, the Not Reconciled Tab will show all columns and data shown in the Verification window grid. Before the Auto-Reconciliation is complete, you will return to this window and verify the Reconciled and Not Reconciled data. Reconciled : This Tab will be empty until the Auto-Reconciliation marks appropriate activations as Reconciled. If you are opening an existing transaction, the Reconciled Tab will show Activations reconciled from the previous action. button. This will begin the process of matching TeleTracker Online Activations & Deactivations with the Service Provider Commission worksheet. The Load TeleTracker Date window will appear. Identify the appropriate Service Provider to match against the imported Service Provider commission sheet. Service Provider : Click the magnifying glass to open the Service Provider Lookup Utility. Select the Service Provider you wish to perform the reconciliation for. Location : Select the appropriate location entity for the Auto-reconciliation. When Location is left blank, it will default to Company Wide. Beginning / Ending Dates : Identify the range of Activation dates you wish to view and/or reconcile. Start / End SN (Serial Number) : Identify the range of Serial Numbers you wish to view and/or reconcile. To identify a specific Serial Number, enter the number in both the Start and End SN fields. Start / End Phone : Identify the range of phone numbers you wish to view and/or reconcile. To identify a specific Phone Number, enter the number in both the Start and End Phone fields. to initiate the Auto-Reconciliation matching process.